Katie Crotty, Yvonne Soto, and Patrick Ryan embarked on a mission when they started Praescient Analytics: revolutionize the way the world understands information with the latest analytics tools. It began as a modest offering, but soon blossomed into a $20-million-dollar business with clients in the Department of Homeland Security, the Department of Defense, and the intelligence community. Over the course of 2012, Praescient Analytics grew to almost 100 employees and currently supports over 16 projects across 26 states and five continents. Ryan explains more below. Tech Cocktail: How did you get the idea to start Praescient Analytics? Patrick Ryan: The founding members of our company started with Berico Technologies as an independent business unit. They formed a partnership with Palantir Technologies after recognizing the potential of their platform. Palantir wanted to change the way key players within the national security realm conducted analysis, so they established a services-based business model that could be offered to these clients. 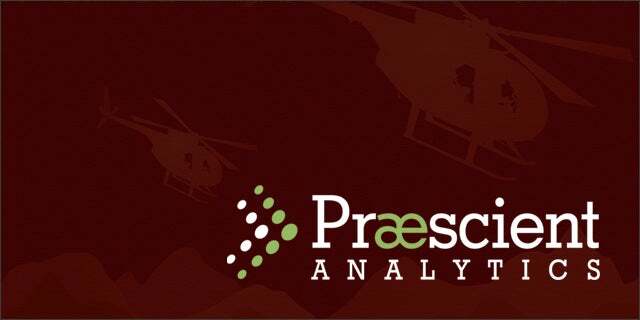 After months of successful service, the time was right to spin off into our own company: Praescient Analytics. We are a service provider to product-focused technology companies that develop analytic and investigative software platforms. Tech Cocktail: What problem did you notice, and how does Praescient Analytics solve it? Ryan: Traditional analytic tools fail to empower individual users to intuitively detect relevant data patterns. After combing through data in order to gain an understanding of the complete picture, it may be too late to take action. We provide three services to our clients: advanced analytics, training, and product customization. By leveraging the combination of technologically sophisticated platforms and dedicated analysts, clients are able to better understand the data that inundates their lives. Our tech-savvy analysts deliver timely and relevant results to strengthen the decision-making capabilities of organizations. Trainers provide affordable solutions for analytic training at every organizational and skill. Our customization service employs innovative engineers who enhance user experience and mission-specialized add-ons. This all leads to greater understanding of potential opportunities, threats, and enhanced decision making ability. Tech Cocktail: Can you give us an example of your services in action? Ryan: A national law enforcement agency requested service from us. They challenged us with augmenting investigation capabilities for 25 of their locations nationwide. We also had to find a way to manage their data relating to personnel and events, and create a streamlined user platform. We built a ground-up training curriculum and tailor-made instructional videos. We also embedded our analysts at nine locations to assist with implementation. Our efforts led to their customized platform being used in a courtroom setting. Tech Cocktail: What are some of the challenges you have had to overcome? Ryan: The geographically dispersed nature of our staff poses a challenge. Our people find themselves working client-side at far-flung locations including Stuttgart, Djibouti, and Wellington. We must find creative ways to communicate and coordinate with our field personnel with video conferencing, weekly deployment notes, and physical care packages. Our hard work has convinced leaders and policymakers that effective intelligence must combine the human element with the power of sophisticated technology. I am proud every day to lead a team of dedicated professionals in this important work. Praescient Analytics was featured at Tech Cocktail’s DCWEEK Mixer & Startup Showcase this past November.